During or after your antenatal ultrasound scan, your doctor or midwife may have told you that your baby has antenatal hydronephrosis. This means that one or both of the baby’s kidneys are stretched and swollen because they are holding on to urine (wee). Antenatal hydronephrosis is quite common, affecting about 1 in 100 pregnancies. Most cases are not serious. The problem often disappears by the time the baby is born, with no long-term effects on the baby or mother. You may need more scans during the pregnancy to find out whether the antenatal hydronephrosis continues or causes problems. Your baby may need tests after birth. Sometimes, antenatal hydronephrosis is caused by other problems, such as when urine refluxes (passes back) towards the kidney, or an anomaly that blocks the flow of urine. Rarely, it suggests more serious problems during the pregnancy or after birth. A few children will need monitoring and/or treatment, such as surgery. The urinary system starts to develop several weeks into pregnancy. It gets rid of things that the body no longer needs, so that we can grow and stay healthy. The kidneys are bean-shaped organs. They filter blood to remove extra water and waste in urine (wee). Most of us have two kidneys. They are on either side of our spine (backbone), near the bottom edge of our ribs at the back. 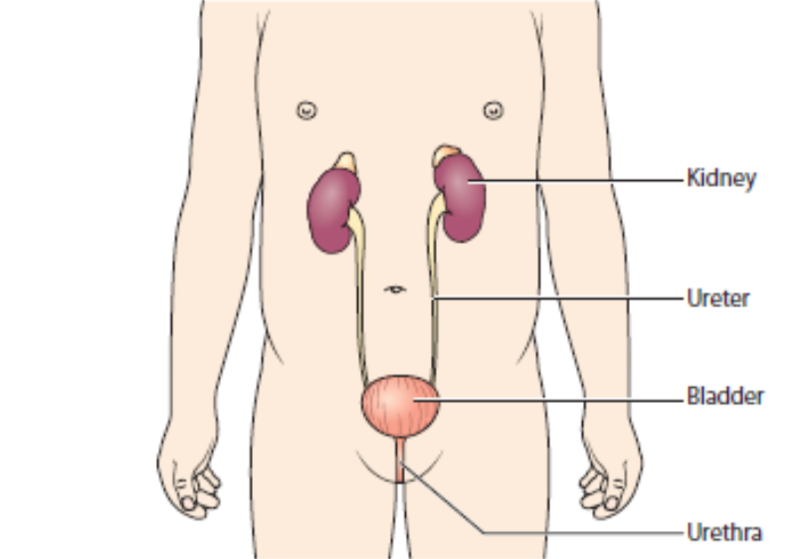 The two ureters are long tubes that carry urine from the kidneys to the bladder. The bladder is a bag that stores urine until we are ready to urinate (wee). It sits low down in the tummy area. Antenatal means that the problem happens before birth. Hydronephrosis means water on the kidneys (‘hydro’ means water and ‘nephrosis’ means a problem with the kidneys). There is a build up of urine in one or both kidneys. Affected kidneys dilate – they swell up and become stretched. Antenatal hydronephrosis is not inherited from the mother or father, and is not caused by anything that the mother does during her pregnancy. Most cases are not caused by any problems, and get better. an obstruction or ‘blockage’ may partially or fully stop the flow of urine. In a few cases, antenatal hydronephrosis can be associated with problems affecting the development of the kidneys or the urinary system. If the scans show a problem, your doctor will discuss this with you. The 20 week antenatal ultrasound scan looks at your baby growing in the womb. Antenatal hydronephrosis may be suspected if part of the baby’s kidney is larger than usual. You may need to go back to the hospital for more ultrasound scans. These scans check whether there is a problem later in the pregnancy and how it is affecting your baby. You may be referred to specialist healthcare professionals, such as a paediatric urologist (a surgeon who treats children with problems of the urinary system) or a paediatric nephrologist (a doctor who treats children with kidney problems). He or she will let you know as much as possible about what to expect when your baby is born. You may need to return to the hospital with your baby for more tests. Many babies who had antenatal hydronephrosis have an ultrasound scan some days after birth, which can help find out the cause and whether treatment is needed. Some babies need other tests. Most children do not have any symptoms after birth. Some are at risk of urinary tract infections (UTIs). Urine is normally sterile (free of germs), but sometimes bacteria (germs) get into the urine and travel into the urinary system. This causes an infection in part of the urinary tract. This is usually in the bladder (also called cystitis). Babies and young children with a UTI may have fever (temperature over 38C), be sick (vomit), feel tired or irritable and not feed well. Older children with a UTI may have pain or a stinging/burning feeling when passing urine (dysuria), may need to go to the toilet more often than usual (frequency) or hold on because it is painful to go, or may wet themselves more often than usual. If you think that your child may have a UTI, contact your doctor. If you cannot reach your doctor straight away, contact 111 or NHS Direct or your local out-of-hours GP service. In most cases, no treatment before birth is needed. In a very small number of cases, an operation may be recommended during pregnancy. This depends on findings from the antenatal ultrasound scans and tests after birth. In most cases, babies can be discharged home a short time after birth. Rarely, babies are born with complications and need to be moved to a neonatal unit, an area of the hospital for newborn babies, for monitoring and treatment. Some babies are at higher risk of urinary tract infections (UTIs). If they keep coming back, they may cause damage to a kidney. To protect the kidneys, it is important to prevent UTIs, and treat them quickly when they do happen. A very small number of babies need other treatment, such as surgery, to correct the problem that caused the hydronephrosis. If your baby needs treatment, a paediatric urologist will explain what will happen. In most cases, antenatal hydronephrosis does not cause any problems for the pregnancy or childbirth, and the baby and mother will not have any long-term problems. Your child will be able to do all of the things that other children their age do. Your child should be able to go to nursery and school, play with other children and stay active. All babies with antenatal hydronephrosis need to go back to the clinic or hospital for more tests and to see the doctor. A very small number of children develop long-term problems with their kidneys or bladder and will need specialist treatment. Antenatal hydronephrosis is quite common, and may affect one in 100 pregnancies. In most cases, it is not inherited from the mother or father. It is not usually caused by anything that the mother does during her pregnancy. Sometimes, your doctor will not know why your baby has antenatal hydronephrosis and whether it will lead to problems later in the pregnancy or after birth. You may need more scans during the rest of your pregnancy to check whether the problem is changing. Your baby may need tests after birth to find out the cause and whether treatment is needed. Which parts of the urinary tract are affected? The kidney has several distinct parts. After the kidney makes urine, it collects in the renal pelvis before passing into the ureter. In antenatal hydronephrosis, the renal pelvis holds on to urine and it swells up. Sometimes, the ureter that is connected to the kidney also swells up. In most cases, there are no other problems with the urinary system, and the antenatal hydronephrosis usually resolves (gets better) before birth. These children will probably not have any long-term problems and will not need follow-up after birth. Doctors think antenatal hydronephrosis with no other problems happens as the baby’s urinary system develops – especially if one or both ureters do not fully develop before the kidneys start making urine. Some cases of antenatal hydronephrosis are caused by vesicoureteral reflux (VUR). In VUR, some urine refluxes (goes back up) towards one or both kidney. In severe VUR, the reflux reaches into the kidney, causing the antenatal hydronephrosis. Some cases are caused by a blockage (or obstruction) that partially or fully stops the flow of urine out of the kidney. If this is suspected, you may be referred to a paediatric urologist (a surgeon who treats children with problems of the urinary system), who will monitor your child. There are different types of problems that cause a blockage. These may be diagnosed after a baby is born, and may need treatment. Posterior urethral valves (PUV): some boys are born with extra flaps of tissue in part of the urethra, the tube that carries urine out of the body. A long, thin tube (catheter) is inserted into the urethra to drain urine. PUV are removed by surgery. Pelviureteric junction (PUJ) dysfunction (or PUJ obstruction): a blockage between the renal pelvis (in the kidney) and the ureter, the tube that carries urine from the kidney to the bladder. In some cases, surgery is needed. Vesicoureteric junction (VUJ) dysfunction (or VUJ obstruction): a blockage between the ureter and the bladder. Many cases get better on their own, but in some cases, surgery is needed. Duplex kidney: sometimes a kidney and ureter on one side of the body develop in two parts. In some cases, one of the ureters dilates (swells) where it goes into the bladder – this is called a ureterocele. In many cases, this will not need follow-up or treatment, but if this causes blockage or reflux, children may need more tests and occasionally surgery. Will it affect other family members? Antenatal hydronephrosis does not usually run in families, and it is not likely to happen in future pregnancies. A few conditions that cause antenatal hydronephrosis, such as VUR, may run in families and may be inherited from the mother or father. 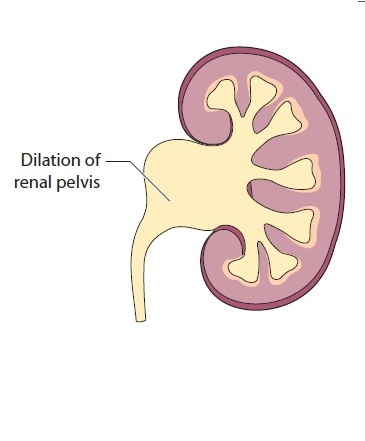 In antenatal hydronephrosis, the part of the kidney that swells is the renal pelvis. The 20 week antenatal ultrasound scan looks at the baby growing in the womb and measures the size of the renal pelvis. the amount of amniotic fluid (or liquor), which is the liquid that the baby is floating in, is normal. Often, the expectant mother will need more ultrasound scans during her pregnancy. These will check whether the problem goes away or gets worse. Your obstetrician may refer you to specialist healthcare professionals, such as a paediatric nephrologist (a doctor who treats children with kidney problems) or a paediatric urologist (a surgeon who treats children with problems of the urinary system). You can speak with these doctors about possible complications and their management. You may need to come back to the hospital for your baby to have imaging tests (scans). These use special scanners that take pictures of the inside of his or her body. The first test is normally an ultrasound scan, which is similar to the scan mothers have in pregnancy. It looks at the shape and size of the kidneys and other parts of the urinary system. A small handheld device is moved around your baby's skin. A machine attached to the probe directs sound waves into his or her body – your child cannot feel these. These sound waves are turned into pictures that can be seen on a screen. Your doctor may also arrange a DMSA scan, which checks for any damage in the kidneys, and/or a MAG3 scan, which shows whether blood is going into the kidneys and whether there is a blockage in the urinary system. These are normally done when a baby is some weeks old. In each test, a chemical that gives out a small amount of radiation (energy) is injected into one of your baby’s blood vessels – a special gel or cream can be used to stop your baby feeling any pain. A special camera takes images (pictures) of your baby’s kidneys. An MCUG (sometimes called a VCUG) checks how your baby is passing urine, and whether there is any reflux (when urine passes back up towards the kidneys). A thin flexible tube called a catheter is passed through your baby’s urethra and a dye is put through to reach the bladder – this does not hurt your baby. A special X-ray machine takes a series of images of your baby’s bladder while it is emptying. Treatment before birth is very rare. It is normally only recommended when there is little or no amniotic fluid (or liquor), the liquid that surrounds the baby growing in the womb. Your healthcare team will speak with you about this. Many babies do not need treatment after birth. This depends on findings from the antenatal ultrasound scans and tests after birth. In most cases, babies can be discharged home a short time after birth. Some babies are at higher risk of urinary tract infections (UTIs). If they keep coming back, they may cause damage to a kidney. To protect your child’s kidneys, it is important to prevent UTIs, and treat them quickly when they do happen. Your baby may need to take a small dose of antibiotic medicine each day – this is called a prophylactic antibiotic. Antibiotics kill the bacteria (germs) that cause UTIs, and so help prevent these infections. Sometimes UTIs can happen even when your child is taking these antibiotics. It is important that UTIs are diagnosed and treated quickly to try to prevent them causing kidney damage. If you think your child has a UTI, contact your doctor or local NHS services. It is important to follow your doctor’s instructions about when and how much to give. Continue to give the antibiotics to your baby as your doctor has told you. A small number of babies who had antenatal hydronephrosis in the womb have complications after birth. These babies may be monitored or treated in a neonatal unit, a special area of the hospital for newborn babies. Occasionally, a baby needs an operation to correct the problem that is causing the hydronephrosis. In most cases, antenatal hydronephrosis does not cause any problems for the pregnancy or childbirth, and the baby and mother will not have any long-term problems. Some cases continue through pregnancy, and a few cause problems after birth. Your child will be able to do all of the things that other children their age do. He or she can go to nursery and school, and can play with other children and stay active. Your healthcare team will speak with you and your family about any long-term effects. This depends on the severity of the hydronephrosis and the cause. All babies with antenatal hydronephrosis need follow-up. This may be for the first year of your child’s life or until he or she goes to school. You will need to go back to the clinic or hospital for more tests and to see the doctor. Some children may be at higher risk of urinary tract infections (UTIs). If your child is taking antibiotics once a day to prevent UTIs, it is important that you continue giving the medicines. Speak with your doctor if you have any concerns. If you think your child has a UTI, seek medical advice. A small number of children who had antenatal hydronephrosis caused by other problems have long-term problems with their bladder or kidneys. Your doctor will give you more information. This may be a difficult and stressful experience for you and your family. If you have any concerns or need additional support, speak with your doctor or nurse. This is the end of the information about antenatal hydronephrosis. If you would like to read more about other kidney conditions, tests and diagnosis, treatment or supporting information, you can find a list of topics covered on the infoKID website at www.infoKID.org.uk. Version 2, March 2017. © RCPCH, BAPN and BKPA 2013, all rights reserved. Reviewed by: March 2020. For details on any sources of information used in this topic, please contact us through the contact us form on our website www.infoKID.org.uk. We take great care to make sure that the information in this leaflet is correct and up-to-date. However, it is important that you ask the advice of your child’s doctor or nurse if you are not sure about something. This information is intended for use in the United Kingdom, and may not apply to other countries. Royal College of Paediatrics and Child Health (RCPCH), British Association of Paediatric Nephrology (BAPN), British Kidney Patient Association (BKPA) and the contributors and editors cannot be held responsible for the accuracy of information, omissions of information, or any actions that may be taken as a consequence of reading this information.